Of the Kitten Kind: The Best Green Smoothies on the Planet- A Cookbook Review. The Best Green Smoothies on the Planet- A Cookbook Review. Heya lovely people of the mysterious Internet. This week sees me preparing for an art exhibition featuring me and some lovely ladies that I happened upon in art school, oh so long ago. I'm really enjoying this no-work baloney, however every time the baby in my guts kicks out a jam, I'm left wondering if this is in fact the moment that my life will change forever. Not so far. Still waiting, waiting. In the meantime, I've been cooking, cleaning and painting. My midwife wants me to get all my art out the way before Le bebe arrives. She's worried about my stress levels. I know that her heart is in the right place, however she does not know that I get stressed when I have nothing to do. This whole "resting" thing is great, but seriously. I could die from boredom. My attention span is short. I need to keep busy. A wonderful little book arrived in the mail late last week to keep me entertained. I love that. Mailbox presents. It's called The Best Green Smoothies on the Planet and as the title suggests, contains the recipes of 150 green smoothies. I have another book on green smoothies and I wondered exactly how much can be written about the smoothie that is incredibly vibrant and happens to come in one of my favourite colours. 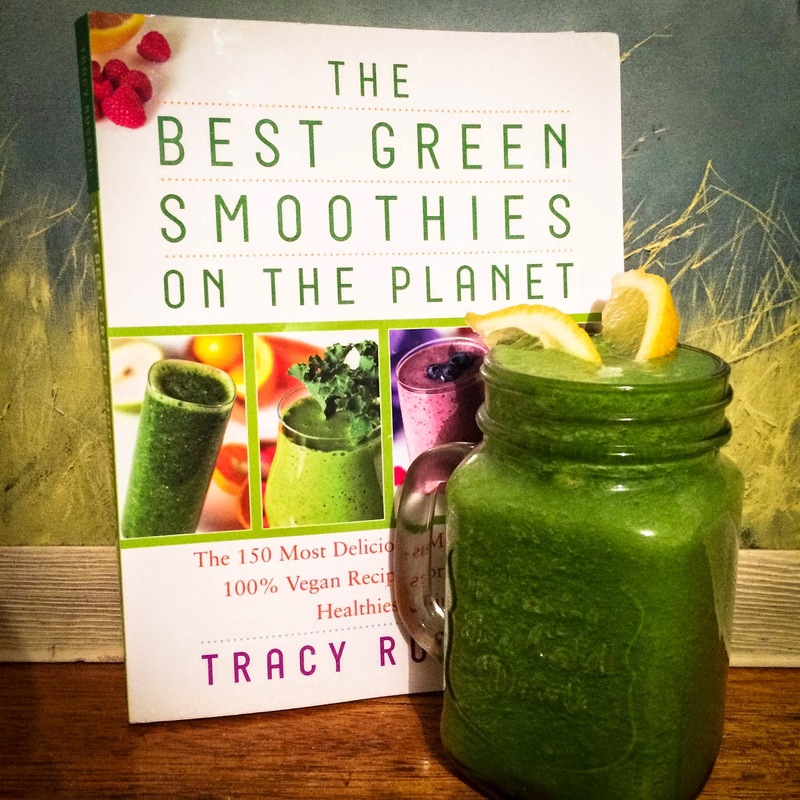 I was pleasantly surprised as I started to read through The Best Green Smoothies on the Planet by Tracy Russell. I mean, obviously, I initially thought that the title really had it's big girl pants on and had a lot to live up to, but I feel like this book is quite different to a lot of the other fad cookbooks out there at the moment. I've read so many that focus on the spiritual side of well being, taking "me" time and all that jazz, and that's all very well and good, but I want to know how these ingredients will effect me and my body and my blood. As someone that has naturally low iron levels (they've actually increased since going vegan BTW), and obviously, as someone that works as a registered nurse, I like to find reasons as to why things happen and then go on to find the solutions. In this cookbook, Russell gives me the information I crave. Sure, she's been on a big "journey" (don't you just love that buzz word? ), loosing weight and decreasing her cholesterol levels all with the help of turning salads into delicious drinks. What makes this book different, however is that not only does she tell you how to make your own concoctions with hints and tips, but the recipes are divided into sections such as "Calcium-Rich Green Smoothies", "Iron-Rich Green Smoothies", "Immune- Boosting Green Smoothies" amongst many other chapters. I really like that. Sometimes I just need a boost and baby, I'm going to skip straight to that chapter. Being pregnant as I am, vitamins and minerals are a major focus for me at the moment. So is making sure that my body is going to handle this whole birth thing. I know it won't kill me and I'm not going to say that I'm looking forward to it, but I do want to make sure I am in the best possible condition with as much energy as possible when it happens. One of the first recipes in The Best Green Smoothies on the Planet to take my eye was the Apple-Mango Green Smoothie, mainly because I had all of the ingredients in my refrigerator. Each recipe gives a brief overview of the benefits of the smoothie involved. The blurb here states that apples are incredibly high in fibre and that the lemon and cucumber have wonderful hydrating properties. Next to the recipe is the nutrition info detailing things like calorie intake, fat, protein, carbs, calcium and vitamins and minerals. This is what is lacking in a great deal of recipe books. So, overall, I quite like this book. It's helpful, handy and most importantly gets to the point without all the fluff. Green house cleaners are also safer not only for the environment (as they are biodegradable and will not contaminate the water supply), but for visitors, customers, and employees.